Wow, what a meeting of minds! 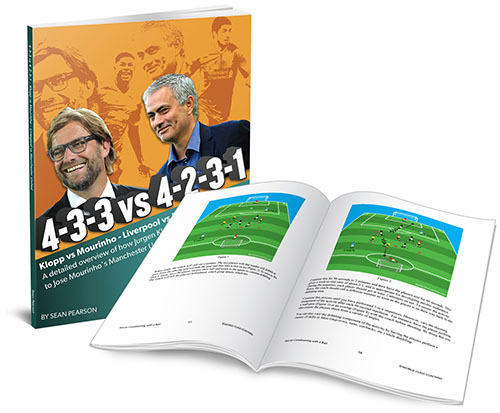 4-3-3 v 4-2-3-1 pits Jurgen Klopp's Liverpool against Jose Mourinho’s Manchester United in an epic clash on tactics and management style. Discover what happens when their playing styles collide in this unique analysis of two of the game's greatest tacticians. What their philosophies are and how they differ. How Mourinho counter attacks using space to overload the opposition. ​How Klopp harnesses attacking midfielders to counterpress. How Klopp’s teams achieve such a relentlessly high tempo. How they both embed mental toughness in their players. Klopp's free flowing interchange style vs Mourinho's positional play. How they motivate players and raise team performance.